"Have a heart that never hardens, and a touch that never hurts," is the theme chosen by the Curry General Hospital Auxiliary. The Auxiliary is a service organization comprised of more than 70 volunteers. Each year the volunteers contribute approximately 6,000 hours working in the Curry General Hospital Gift Shop, as hospital greeters, by baking cookies and delivering them to hospital staff monthly, scrub sales, and other fund-raising activities. Through the gift shop and other fund-raising efforts such as the "Tree of Love", bake sales, raffles, soup kitchen, scrub sales and Christmas Bazaar booth, the volunteers raise thousands of dollars annually for new equipment and health services. 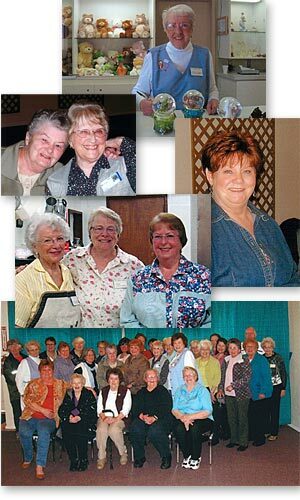 In the two-year period ending in 2012, the Auxiliary contributed almost $24,000 to Curry General Hospital. Knitting items for the baby gift baskets for all babies born at Curry General Hospital is a service the Auxiliary volunteers especially enjoy. In 2012, the Auxiliary donated 78 gift baskets for newborns, and each January the first child born in the New Year receives a special gift basket. For more information about becoming a volunteer or to learn about volunteer opportunities, please call Bonnie Snyder at 541-247-2620, or stop by the Curry General Hospital Gift Shop for an application. The Auxiliary meets the first Monday of each month at 11:30 a.m. in the Showcase Building at Event Center on the Beach, 29692 Ellensburg Avenue, Gold Beach. In addition to the Auxiliary volunteers for Curry General Hospital in Gold Beach, Curry Medical Center in Brookings is also fortunate to have the CGHA-Brookings organization. For more information about the Brookings Auxiliary, interested persons may contact Pat Gulik at 541-254-0293.